What magic will you take into 2019? - Christine Sheehy & Co.
14 Dec What magic will you take into 2019? When I took a step back in my business this quarter, I had grand ambitions about what I was going to achieve. After a year of late nights and early mornings trying to juggle multiple projects, I needed to slow down. I decided I wouldn’t actively pursue loads of client work. I would simply complete the projects already in my workflow, along with any that organically came my way. As for the rest of my days? I would exercise regularly, get back to my journalling, blog regularly again (ahem) put some great systems in place for my business, get proper sleep, enjoy all the end of year celebrations at my kids’ school and complete all those courses I’ve purchased yet never finished. As I consciously worked to bring more flow into my days, I realised how little time there really is in a school day. Go to a 9am gym class, update your social media, answer a few emails, make a few phone calls, sort out some admin, and before you know it, the kids are crashing through the door wondering what’s for afternoon tea. All of this made me really think about what I commit to in my business. Between doing the client work, creating content and programmes, and running the administrative side, there are precious few pockets of blank time in which to immerse myself in study. Sure I can (and do) get up an hour early, but what should I do in that hour? Exercise? Meditation and journalling? Or work on a course? So many priorities, so little time. If you’ve been in the online space a while, no doubt you too have unfinished courses on your hard drive. Gorgeous shiny objects that appeared to hold the answer to your most pressing problem, yet turned out to be giant distractions. When we sign up we have the best of intentions to show up and do the work. But then life or business gets in the way. We go through a busy patch, slip behind, lose momentum, give up and feel guilty about the money we have invested. Or maybe you find you just weren’t ready to learn Facebook ads, build a membership site or master SEO, and just like a gym membership, paying the fee is no guarantee you will do the work. Then along comes another shiny object that looks like the exact thing we need to solve our next pressing problem…. I’ve heard these courses called “divine decoys”. They look like the magic fix, when what you really need to do is quit chasing knowledge, and concentrate your energy on tasks that will actually move the needle in your business. That’s also why in 2019, I’m focusing on a live coaching model for my messaging programmes. For so many years evergreen courses were held out as the holy grail for an online business owner. Leverage your time, invest everything in a massive launch, burn yourself out, sell a gazillion places and retire to the beach – blah blah blah. It’s a model that can and does work well for many. But as a business owner, I don’t like the distance between myself and the customer. Sure, it’s the customer’s responsibility to implement the learnings – but I want you to get the maximum impact out of the work we do together. 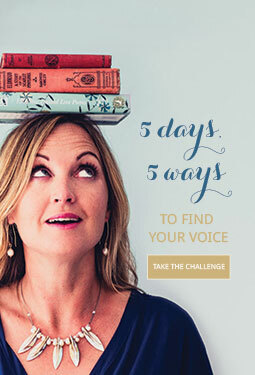 I want to work with you in partnership to drive real shifts in your business – and in YOU. For me that means teaching my classes live, not pre-recorded. Keeping the content fresh and responsive to the needs of the group, being able to follow inspiration and engaging in the mutual exchange of energy and ideas that elevates the group experience into something truly magical. That’s what happened with my Illuminate Messaging Lab this year. The combined energy, commitment of the wonderful women in the group led to significant breakthroughs in vision, purpose, message, brand presence and connection with their audiences. That magic is the feeling I most want to take forward into 2019. Next year, I’ll be intentional about what I’m creating and the way I’m delivering value in my business, in order to keep that magic alive in my work. I invite you to be truly intentional about the investments you make in your business too. Whether you’re investing your time, your money or your training budget, focus on the tasks, the people and the programmes that will help you make major shifts. Look for opportunities to engage with others, to get feedback and support, to harness that combined energy that will help us all to fly in 2019. 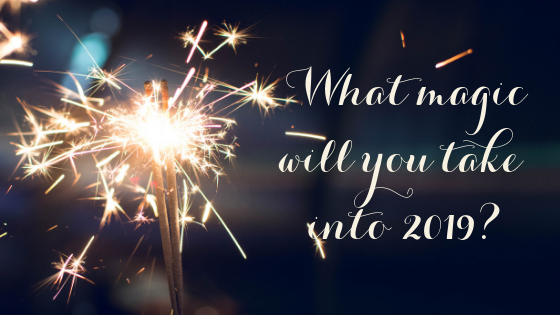 So what magic will you take forward into the next year?